To excel in today's exacting world, organizations need to combine strategic planning and strategic thinking. Strategic planning is a formal activity carried out periodically by top managers, but it is vulnerable to change. Strategic thinking is an informal activity that occurs intermittently throughout an organization, but it tends to be non-cumulative. 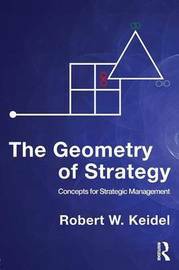 Keidel offers a framework for integrating strategic planning and strategic thinking that leverages the strengths of both. 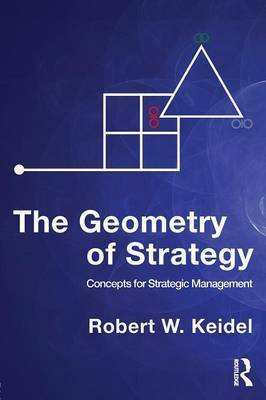 The key to his work is the application of simple geometric forms--especially, 2x2 grids and triangles--that help organizational leaders and strategists structure their thinking and planning. Keidel introduces four strategic categories--persona (organizational identity), performance (what is measured), puzzle (dilemmas that are faced), and pattern (how to compete, grow, & organize). Each category matches a specific geometry of thinking--point, linear, angular, and triangular. The payoff? A novel way to develop strategy, as well as a set of conceptual lenses for "reading" any other organization's strategy--or any strategic argument. Keidel's work is illustrated with case studies from his own consulting practice and grounded in the theoretical literature underlying the various geometries of thinking. This book will be a valuable resource for managerial and executive education in strategy, as well as a provocative reading for organizational strategy consultants and thoughtful practitioners. a a a Robert W. Keidel is Clinical Professor of Management at the LeBow College of Business, Drexel University. He also is principal of Robert Keidel Associates, a consulting firm based in Philadelphia. A former corporate manager and Naval officer (Vietnam veteran), he was a senior fellow at the Wharton School, University of Pennsylvania, and a program consultant at the National Center for Productivity and Quality of Working Life. Keidel's articles have appeared in The New York Times, The Wall Street Journal, Management Science, and several other academic and practitioner-oriented journals. He is the author of three previous books: Game Plans: Sports Strategies for Business (Dutton, 1985; Berkley, 1986; Beard Books, 2006); Corporate Players: Designs for Working and Winning Together (Wiley, 1988; Beard Books, 2005); and Seeing Organizational Patterns: A New Theory and Language of Organizational Design (Berrett-Koehler, 1995; Beard Books, 2005), which was nominated for the Academy of Management's 1996 George R. Terry Book Award. Keidel received his BA from Williams College, and his MBA and PhD (Social Systems Sciences) from Wharton.